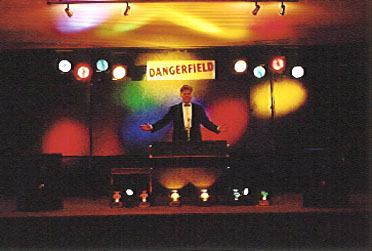 "The Original and The Best"
Dangerfields are well-known for their larger dances. 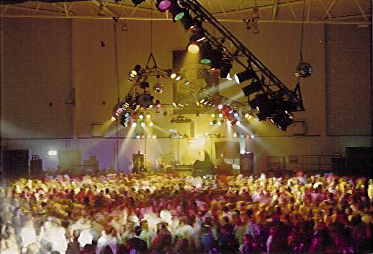 We are considered one of the premier production DJ show providers in Brisbane. 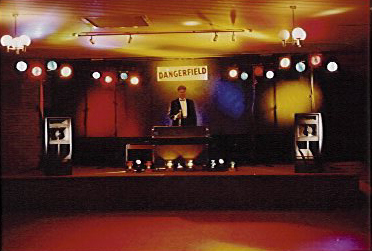 In the mid 80's and early 90's, Dangerfields took School and University Dances to new heights, with a level of technical expertise previously only found in touring bands. We now provide huge light and sound rigs for shows attended by thousands of people on a regular basis. We have been the first choice DJs for the Terrace and BBC Dances since 1993 and regularly work for Brigidine College, Brisbane Grammar School, Stuartholme, Clayfield College, Our Lady's Annerley & St Rita's . Past regulars include Mt.St.Michaels, Corpus Christi, Moreton Bay College, Girls Grammar, Marist Ashgrove, St.Laurences, St.Aidans & Nudgee College. This is for when you need a little more power. The 8-Can Rig throws light through the room creating a sense of movement & colour. N.B. Individual component prices may vary subject to equipment availability & supplier's price on date of function. Actual options supplied will be selected so as to fit into the budget and to allow for a small return. Prices above are as per cost from the suppliers. CANS 350/650 Watt Bulbs, housed in a casing that resembles a tin can, that project a largish beam of light onto walls, ceiling or floor. Set up in groups of 8 or 16 fittings and controlled by a chaser that makes them flash in regular patterns. Great for getting light and atmosphere out into a room. 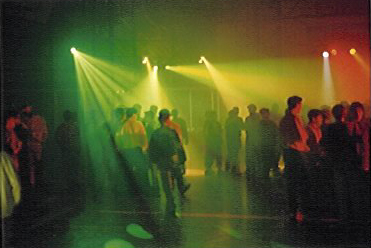 STROBE High power white light flashing at high speed to create a sense of stop-motion in the room. Generally used to accentuate specific parts of the music. MIRROR BALL You know this one; a sphere covered in mirror tiles that reflects points of light around the room. SMOKE MACHINE Also known as a Fogger, they pump mist into the room to help make the lighting more visible and effective by defining the individual beams of light. ROBOSCAN PRO218 Computer controlled intelligent light fitting that changes color and patterns, and moves around the room creating blades and cones of light. INTELLABEAM The latest generation of Intelligent Lighting, more powerful than the Roboscan. Each fitting is controlled by an operator with a computer. The Intellabeam is a powerful light that can create moving patterns on walls and floors with an almost laser like intensity. A WARNING There are operators who will claim to be using Intelligent Lighting effects, but in reality they are using cheaper "look-alike" alternatives that are not under computer control or sound activated Disco Effects. The effects that they generate are just not as powerful or effective.